Note :Apple Watch Magnetic Charging Cable and other device accessories are not included. 1. Before use, please ensure that the voltage is in the range of 100-240V and stable voltage.If not, stop using! 2. Make sure that the charging cable can be used safely (Don't use the no certification cable or the aging cable, then connect the power adapterto a power source. 3.When power indicator light is on, you can use it safely.Please remove the charger from the socket after the item is fully charged. 4.If no power indicator, please stop using and contact manufactuere directly to get the after-sale service. Certified by CE, FCC, and its multiple circuit protection for overcurrent, overheat, short circuit, the whole charging process is rigorously protected. Even your device may fail to protect, we surely won't. Adopting the high quality refined crafted ABS Plastic, the Simpeak Charger is well balanced with lightweight and high strength. So you can keep its new look through long-time wear and scratches. Together with other three USB ports, the charger can charge 4 mobile devices with 5V input simultaneously. The smart charging technology enabled charging your device at any port with the fastest speed, meeting needs of the multi-device owners and the family. Dimension: 90 x 90 x 70mm / 3.54 x 3.54 x 2.75 in. 1. Multifunction Charger Box --- Custom made charging stand steadily holds Apple Watch (all versions compatible) from falling. With combined DC Output (5V 6.0A Max) current, the charger charges up to 4 mobile devices simultaneously, meeting charging needs of a household. 3. Smart Charging for All Ports --- With built-in smart chips, each port can automatically detects your device and delivers fastest charge required (up to 2.4 amps). AC input:100V-240V 50/60Hz. You can charge for your iPhone 5 6 7Plus or Samsung Galaxy S8, Note 8 or other smartphone. 4. 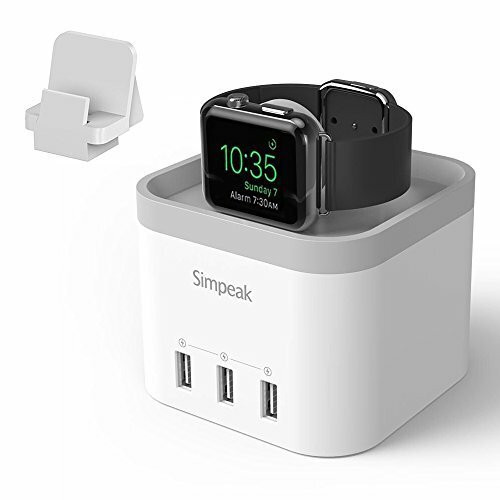 [Nightstand] Clock Mode Supportive --- Thanks to the flat deck design, the Nightstand Clock mode of the Apple Watch (charging and on its side) is enabled when charging with the Simpeak Charger Dock. Now you just get better use of your Apple Watch.